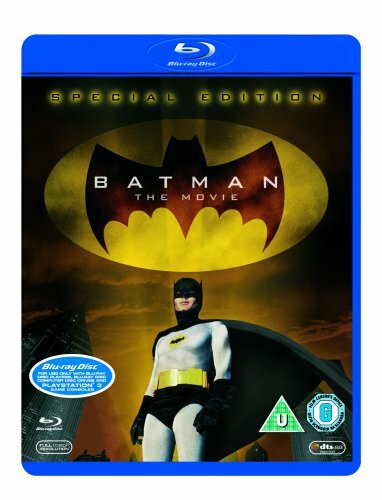 Batman: The Movie carries the high camp absurdity of the 1960s TV show to gleeful new heights. Shark Repellent Batspray, costume-removing Batpoles, a contraption that dehydrates political figures into coloured powder, and endless childishly easy conundrums. Bringing the primary-coloured show to the big screen was a natural move, since sets, costume and casting were all in place. But what elevates the movie above the series? Is it the wonderful new toys--the Batcopter, Batboat and Batbike? Is it the OTT direction, taking the Dynamic Duo on location far more than usual? Or is it the electrifying one-upmanship between Burgess Meredith (Penguin), Cesar Romero (Joker), Frank Gorshin (Riddler) and Lee Meriwether (a new Catwoman since regular Julie Newmar was busy elsewhere)? As Commissioner Gordon says, "The sum of the angles of that rectangle is too monstrous to contemplate!" Really, the best of the movie's magic is to be found in the sheer glee Adam West and Burt Ward exhibit in playing for the big screen. This was the most exciting event in their careers. And it shows in their colourful, zestful performances.